On a very cold Monday in February I went into the Wimbachgries (Wimbach drainage) and climbed an alpine ice route on the right side of the valley under the Apelscharte. Other than the cold, the ice and snow conditions were excellent. 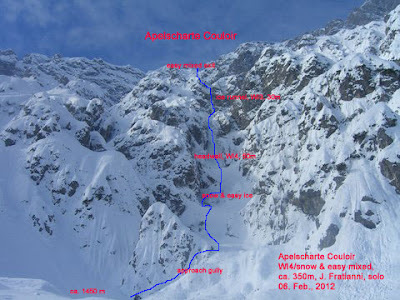 The Apelscharte Couloir has ice sections to WI4, steep snow & easy mixed terrain at about 350 meters in elevation difference. The most attractive feature of the climb was the 50 meter compact ice fall in the middle of the couloir. Before getting to this spot, there was about 150 meters of snow and easy ice. Despite the very low temperatures, the ice was in great condition for climbing and felt very secure. Looking up from about 15 meters into the pitch. Cold, steep, compact ice. I climbed the route in my Dynafit TLT 5 Performance boots and Black Diamond Cyborgs set up as Mono-points. The climb was a test to see how well the boots would work in moderate alpine terrain I used my trusted, and well loved, Black Diamond Cobras. The TLT's are incredibly light - they weigh less than most standard winter alpine boots. A number of climbers in Chamonix have used them to do some very impressive climbs and link-ups. Balanced on my front points and looking down from the top of the central ice pitch. I took two 30-meter twin ropes with me. I normally trail the ropes behind me on steep and more technical terrain. In this way I can set up a self-belay or retreat quickly without complications. This is in the easier ice runnel looking up towards the exit of the couloir. I have set an ice screw to self-belay while I rest and take a photo. My ice tools are attached to my harness with a Black Diamond Spinner leash. I had four ice screws, a couple of pitons (baby angle & knife blade), two 120cm slings, one 60cm sling, three quick draws (2 normal & one 60cm sling rigged as a quick draw), 3 locking carabineers and pieces of accessory cord. The exit to the Apelscharte was snow with some easy mixed terrain. I down climbed and rappelled the descent back to my skis. On the descent, I was surprised by how steep the couloir was, because while climbing I didn't have the same feeling of exposure. The ski out was some nice powder turns, and then the long cruise out of the low angled part of the drainage and onto the forest road. It was cold! I couldn't ski too fast, and had to make some stops, to warm up and keep from getting a cold induced headache. My feet felt like two wooden blocks by the time I got back to the parking lot. The approach to the couloir is 950 or so meters of elevation gain and is long (maybe 6-7 km). You take the right hand side of the drainage, heading towards the Loferer Seilergraben. It's a good 2.5-3 hours before you can turn into the couloir entrance at about 1450 meters. There were some amazingly impressive avalanche run outs from the flanks and cliffs of the right hand slopes when heading into the valley. Take care when skinning in that you stay well left of the right hand flanks.